How many hundreds of paint cans have I thrown out?! I may never again after seeing what Scavenger Chic did with hers!! Visit her page to see her chalkboard container paint cans, also. This unique piece from Nicer Than New is simply smashing with it's beautiful wood and black two tones! Who says a headboard has to be used as a headboard? Not The Interior Frugalista! Hi Kammy, thank you for Trash to Treasure. Always look forward to joining in. I loved your Fence Post and Pallet Loft bed. Thanks for hosting Kammy, love your site!! 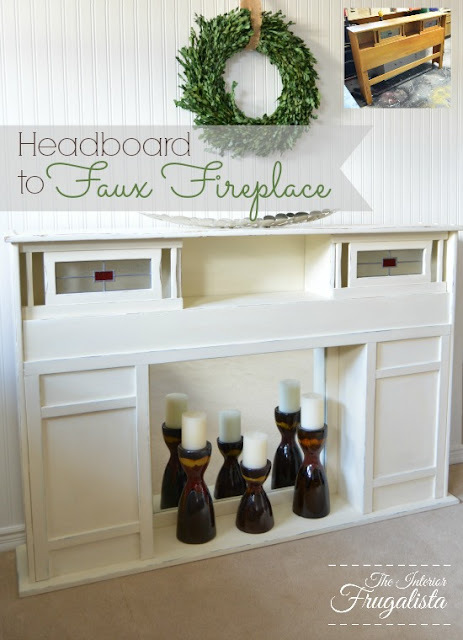 Hi Kammy, what a surprise to see my Headboard to Fireplace featured here at the party this week! Thank you so much, you made my Tuesday! Thanks for hosting Kammy and have a great day. Not sure why the image on link #20 (A Touch of Pink) is not showing up! Hi Kammy! Thanks for showcasing my desk makeover. It really is a one of a kind piece! Great party and thanks for hosting!